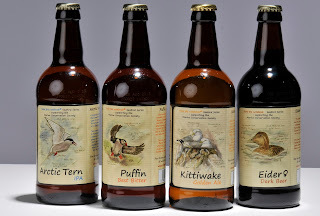 From the Notebook's inaugural Seabird Series is now complete with the October fledging of Kittiwake, our Golden Ale. 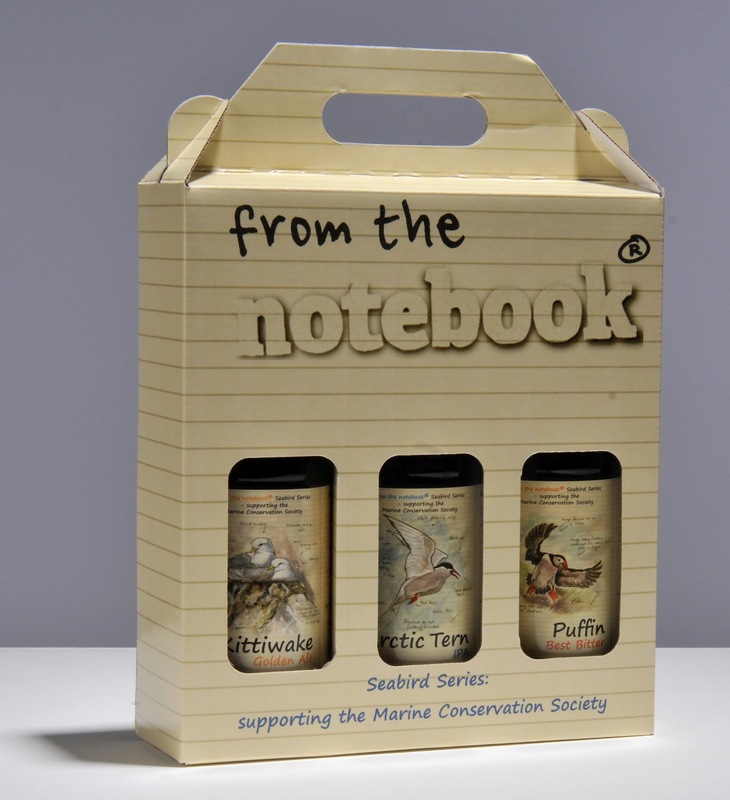 This completes our first batch of brews, made by Allendale Brewery in association with The Marine Conservation Society. Not bad going for a Company which came into being in February. Q: You have 4 beers and a 3 bottle gift set. Idiots! How does that work? A: 4 into 3 does go! This cunningly allows a "mix and match" approach for the 3 Bottle Gift Sets, so that personal tastes for beer styles can be addressed more accurately. Our policy is to provide the Gift Set Boxes to retailers at cost, giving them the freedom to allow customers to choose their own configurations. If your gift recipient is an IPA/Golden Ale fan but doesn't like dark beer, then fine - give him/her 2 Arctic Terns and a Kittiwake. Job done! 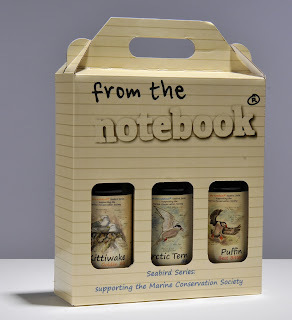 3 Bottle Gift Set: These really do make exceedingly nice Christmas gifts. Migration of the beers from the warehouse has started in earnest over the past month. Steve at Northumbrian Gifts has been successful in distributing to the likes of St. Aidan's Winery on Lindisfarne, a prime site, we hope for sales in Northumberland, as well as shops in Bamburgh and beyond. The department chain Beals have taken stock for their shop in Hexham, where we hope that sales over the Christmas period will be brisk. In Nottinghamshire and the surrounding areas, From the Notebook beers can now be found at Local Not Global in Beeston, The Deli @ Radcliffe, Hops in a Bottle in Mansfield, The Real Ale Corner in Chesterfield and The Real Ale Store in Newark. Hopefully more stores will take migrant birds, allow them to nest in their shops for a while before moving onto pastures new. Perhaps underneath Christmas trees? A big thank you to Kap at KNK who helped us with the merchandise photography. KNK is the place to go in Nottingham for picture framing. KNK were responsible for producing beautiful framed versions of the artwork from our bottle labels. These framed pictures are also available for purchase either through FTN or KNK directly (click here). They also do a stunning 4 panel version of all the birds in the Seabird Series which is selling particularly well. Call me or KNK for a quote today! Dare I say it, but a picture/beer combo make a pretty awesome "his and hers" gift for Christmas! Not too sexist a comment I hope! That's all for now. 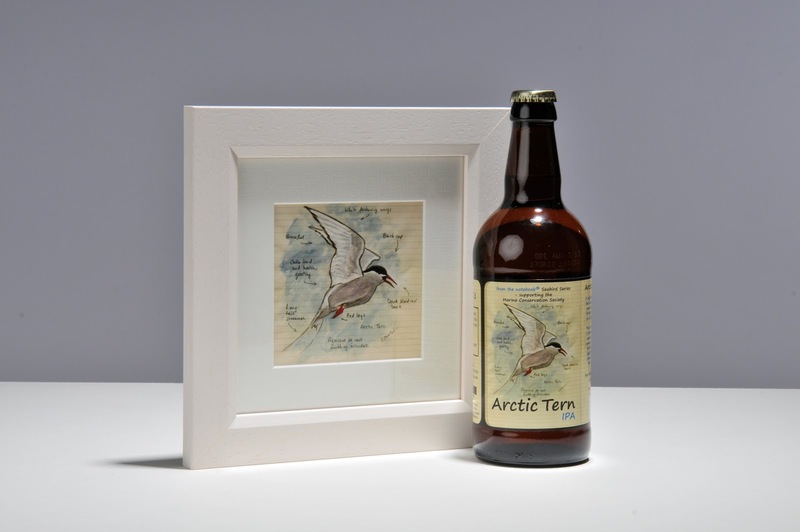 I've an Arctic Tern in the fridge with my name on it. Cheers, Graeme.